A few years ago, the North Carolina University Extension published a report on grocery store shopping habits. The results were very telling. Consumers only spend 12 seconds in a grocery aisle section before moving on to another area. And they only look at 1.2 products on average before deciding on a brand. These two facts have stuck in my mind ever since. They represent the two biggest obstacles to launching a new specialty brand – and they are pretty far down the sales chain – actually at the very end. They serve as a reminder that no matter how pretty your packaging is or how competitive your pricing may be, a customer armed with a brand preference before they walk down the aisle is the best customer to have. So, what can you do to build brand preference? The old adage that great marketing can always sell any mediocre product once, but only a quality product can guarantee repeat purchases is never more true than in today’s 24/7 connected world. In the 21st century, word-of-mouth is fast becoming the driving force behind brand awareness. And post-purchase becomes the most important part of the sales life cycle. 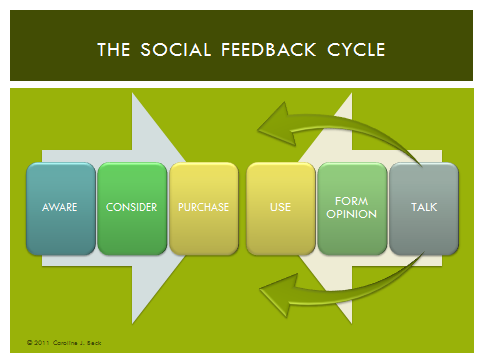 Like it or not, you are a part of the new social feedback phenomenon as soon as you sell a product. Let’s look at what happens in the life cycle of a purchase. In the 20th century, it was enough to build awareness, get on the “considered” set and hope for a sale once in-store. Now, the most important part of building brand preference happens AFTER the sale. When your customers use your product, form their own opinion and then start telling everyone who will listen what they think of your brand. Good or bad opinions can go viral overnight. Building a mechanism for direct feedback from the customer is essential. Make sure it’s easy for them to find you by printing your web address on the label. When they get there, provide a forum for their comments and a clear means of contacting you. And if any comments warrant a response – respond. Nothing builds better loyalty than when your customers think you care and that you are a good listener. Give customers the opportunity to tell you how they use the product, as well as an opportunity to share their opinions with their own set of “friends”. Create links between your site and other social media like Facebook and Twitter. Best of all, be in that space yourself. Think of your Facebook page as a second website for your brand. The more opportunities you create for post-purchase engagement, the more likely you are to build a customer base of “active loyalists”. Loyalists who will help spread the word about your brand. Loyalists who will be pre-disposed to buying your brand again and again – even in the face of retail temptations like competitive price breaks. Remember that second only to product quality, brand loyalty reaps the greatest rewards. So think carefully about how to engage your best customers and turn them into active loyalists. They can help you beat that 12-second clock.